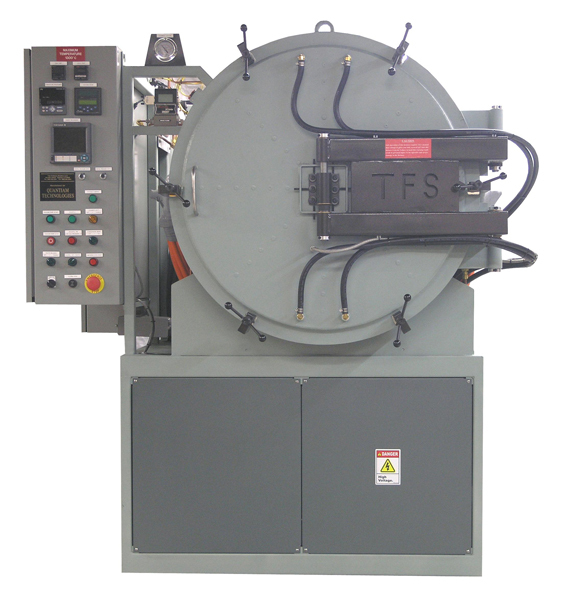 This furnace is furnace is designed to operate in either rough vacuum, partial pressure of argon or nitrogen up to approximately 10 Torr, or full atmosphere operation with nitrogen or argon. This is an assembled unit that is shipped as one piece, requiring only the water, gas, and power to be connected to the appropriate locations. A clean, dry, empty, burned out furnace will be capable of achieving 50 milliTorr vacuum or better and have a leak up rate of no more than 10 milliTorr per hour after a vacuum bake out. Work load of approximately 200 pounds. Yokogawa UP55 digital programmable temperature controller with 30 programs and 300 segments. Standard control will use a Type “K” thermocouple. Manual valve operation, automatic ramps and soaks with the Yokogawa UP55. Graphite heating elements on the right and left sides of the hot zone. Leybold D60 mechanical vacuum pump with Edwards EH250 Roots blower. Cold trap to collect binders. This unit is leak-tested with a helium mass spectrometer, with no detectable leak in the 10-9 range. Includes one day of test fire and training at our plant in Terryville, Connecticut, USA. 6-channel Yokogawa paperless datalogging chart recorder with digital communications. Network compatible – can appear as a node on a network, making remote data gathering fast and easy. Includes built-in memory card for storage. 6-channel thermocouple feedthrough port for 1/16” Type “K” thermocouples (not included). Yokogawa Light Loader to facilitate uploading and downloading programs, configuration files, and auto-tuning parameters. This device clips on the face of the Yokogawa UP550 instrument and plugs into a USB port on a PC-based laptop or desktop computer, greatly facilitating and simplifying instrument configuration, program storage, and auto-tuning. Can be used for writing programs and storing detailed configuration data.